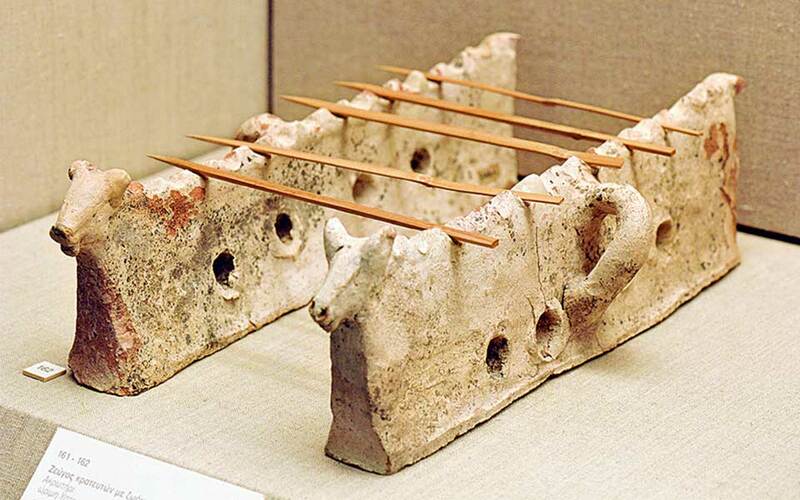 Firedogs or “souvlaki trays” with bulls-head finials, from Akrotiri, 17th c. BC (Archaeological Museum of Thera). Ancient Greek nutrition appears to have been fairly well-rounded, closely matching modern nutritional recommendations. A desirable balance among grains, fruits, vegetables, meats, and dairy was likely easily attainable for the average citizen in ancient Greece. This wide variety of natural food products available would have allowed for a versatile diet without neglecting any macro- or micronutrient groups. Grain products provided a base for the average Greek citizen’s nutrition, as breads, ground barley, and gruel were all staple items found at most meals. Abundance of barley in the Mediterranean area led to its use in many dishes. Kykeon, a sort barley gruel often mixed with herbs, cheese, or wine, was a principal beverage next only to water. Wheat was typically imported due to its agriculture struggles in the area, making white bread a symbol of wealth among the ancient Greeks. Fruits, vegetables, and legumes made up the next largest food group within ancient Greek nutrition. Soups made of mashed vegetables or lentils were commonplace, often flavored with garlic and onions. Oak acorns, though not typically considered a food in Western culture, were a common morsel among the poor, and chestnuts were enjoyed among all classes. Sweet fruits like pomegranates, figs, grapes, and raisins served as excellent snacks and side dishes. Olives served a versatile role, both as a common snack eaten fresh or preserved, and as an oil, pressed for use in both cooking and consumption. Meat consumption, both domestic and wild, didn’t hold as large a place in ancient Greek nutrition as it does for Westerners today, though it was still consumed moderately. Small amounts of pork was commonplace at meals among all classes, typically in the form of sausages. Fowl was sometimes eaten among the wealthy, though eggs from quails, pheasants, and chickens were consumed more often. Dog meat was eaten to some degree, though it was not as common as other meats. Coastal cities consumed and exported seafood such as tuna, swordfish, eel, octopus, and shellfish. Considered a delicacy within landlocked areas, seafood was typically preserved with salt before selling and was cooked with simple herbs. Freshwater fish such as catfish were commonly available as well. Goat cheese, though often eaten plain, was included in a wide variety of dishes within ancient Greek nutrition. It could be mixed into wheat and barley pancakes, served with fish, mixed into soup or kykeon, and served with many other dishes. Aside from milk-drinkers in rural areas, milk was typically only used for making cheese and other dairy products that were similar to yogurt and cottage cheese. Consumption of wine in ancient Greece would have provided some nutritional benefit, both for its antioxidant content and its antiseptic properties. Quite accurately, a number of ancient writings make it clear that within Greek culture, drinking a moderate amount of wine was considered healthy. In Homer’s Iliad (8th century BC), the character Hecabe claims that “when a man is weary with toil, wine greatly increases his strength.” In his play Semele or Dionysus, the 4th century BC poet Eubulus uses three bowls of wine (mixed with water) as a symbol of moderation, relating that the first bowl is drunk for health. Eubulus also advises against drinking more than the three bowls, warning that fights, revelries, and vomiting follow. Such overconsumption would, of course, outweigh the health benefits of wine consumption, and the Greeks appear to have been well aware of that. In fact, a large number of ancient Greek writings make it clear that wine was almost always diluted with water, partially to avoid overconsumption. It was considered barbaric to drink wine undiluted, and within Greek writings, those who are referenced drinking like this are typically scolded. To make the diluted wine, the mixer would take a kylix (drinking bowl/cup), fill it with water, then add the appropriate amount of wine. Though a water-to-wine ratio of 20-to-1 is often cited, the actual ratio was typically between 3-to-1 and 6-to-1. On rare occasions, ratios as strong as 1-to-1 could be mixed. The 20-to-1 figure comes from Homer’s Odyssey (8th century BC), in which a mythologically powerful wine has to be diluted with twenty parts water to make it palatable. Preparing the Kykeon: A woman grates cheese, perhaps for the “kykeon” potion described in Homer; terracotta, with red, yellow and white paint; Tanagra, Boeotia; early 5th century BC (Museum of Fine Arts, Boston). Some Greek citizens engaged in special diets for various purposes. Olympic athletes were instructed to eat meat-heavy diets and to restrict dessert and wine consumption before the Olympic Games. (Milo of Croton was said to have eaten 20 pounds of both meat and bread each day.) Some citizens chose to be vegetarian for various reasons, ranging from religious and philosophical arguments to concern over the welfare of animals. To an even further extreme, some philosophers would live only on water and wheat products, such as bread and gruel, in an effort to lead simple lives. The average Greek citizen likely had a fairly healthy and well-rounded diet by today’s standards. No major food groups were neglected, and it appears all groups were eaten in proportions similar to modern recommendations. Grains, rich in carbohydrates, held a prominent position in their diet. Moderate meat and fish consumption in combination with fairly heavy legume consumption would have led to adequate protein intake. Fairly heavy use of olive oil and cheese would have provided plenty of fats. With these things in mind, it is safe to estimate the macronutrient caloric ratio for the average Greek citizen would have been around 35-50% carbohydrates, 20-35% protein, and 20-40% fats, which would fairly closely match modern recommendations for an active individual. Listed below are some foods that would have been commonly found in the ancient Greek citizen’s diet, organized roughly by food group. Its constituents largely resemble those within Roman nutrition due to the geographical proximity and overlap in culture. Wilson, N. G. (2005). Encyclopedia of ancient Greece. New York: Routledge. Dalby, A. (2016). Siren feasts: A history of food and gastronomy in Greece. London: Routledge. Voutsaki, S., & Valamoti, S. M. (2013). Diet, economy and society in the ancient Greek world. Peeters Bvba. Ensminger, A. H. (1994). Foods & nutrition encyclopedia. Boca Raton: CRC Press. Wilkins, J., Harvey, D., & Dobson, M. (1995). Food in antiquity. Exeter, UK: University of Exeter Press. Gilleland, M. (2004, October 25). Wine and Water. (Archived here).